Basement of Ghoulish Decadence: What's with all this Fright Night 2 insanity? I'm not sore that I never got around to picking up Artisan's now out-of-print DVD of Fright Night Part II that's now demanding an average of 'fiffy to over 'hunerd buck on Amazon and eBay. Though as a PSA to all, this disc isn't worth those prices and kinda not worth the cheapo bargain prices it could have been had for when still readily available. When Artisan sunk under Lionsgate's umbrella in 2003, many of their late '80s/early '90s horror catalog DVD titles saw their days numbered, and Fright Night Part II seemed to vanish overnight. Like Fright Night, this sequel was originally shot in 2.35:1 scope, but Artisan's disc features a composition-shattering pan-and-scan full screen transfer much like ye olden VHS of yore. This seems right since the source for the DVD's transfer is the old hazy video master utilized for the International Video Entertainment (I.V.E.) cassette. As these captures in the review over at Taliesin Meets the Vampires attest, the film's presentation on Artisan's disc looks like a weak Laserdisc at best anyway. Artisan's DVD otherwise has nothing going for it in the supplemental material department unless you count the cool cover art and chapter list insert as extras. So my advice is to either be patient in your search for this disc or go the much cheaper route and find a copy of the not-really-worse VHS. I went with the latter and so far have found three copies in good viewing condition for the total price of a McDonald's value meal. Sure, I'd snag the disc if ran across at a swap meet, but sellers trying to pass off copies for $130 are not of their right minds. I understand the desire for zen-like DVD symmetry. There are those out there who feel a slight tinge when looking at Fright Night all alone on their plastic movie coaster rack, but it seems nutty to blow such a collector's market chunk of change on such a limpdick attempt at a digital presentation. That's outrageous...50-100 dollars for Fright Night 2! I do like that sequel quite a bit, but could never pay more than like 10 bucks, unless the extras were killer. You're so "not that" cool Brewster, that you're worth that much cash! I guess Im lucky! I got my artisan copy. Not a bad sequel, but the dvd isnt all that special, its got no extras whatsoever. 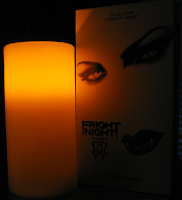 I guess Im lucky cause I still got my dvd of Fright Night II, though its not that big of a deal. I mean, its not widescreen and its got NO extras whatsoever. Still, its a decent sequel, I enjoyed it. I can't believe those prices. That's insane. Are people really buying them for that price or are they just listed in that range. Vampire bowling is cool, but not at that price. The cover art and the chapter list are considered extras? Sounds very bare bones to me.